Mosquitos bring about diseases like Chikungunya, Dengue, Malaria and Zika. We can only do as much like make sure our houses do not have stagnant water where mosquitoes breed as well as our trash bins have lids to avoid flies and other flying insects and bugs to spread. There have been multiple ways to avoid these diseases like putting up a screen mesh at our windows and doors yet we can never be too reliant. In each household we can only take care of one person at a time and when you have kids. Protecting them from these deadly diseases is also a priority. Here comes - Strike Patch for kids! 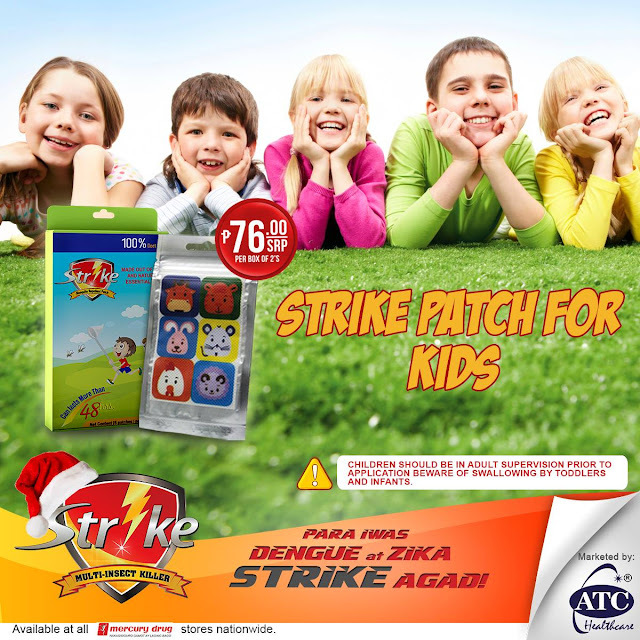 ATC Strike Patch is a mosquito repellant that you can stick on their clothes. It is made from 100% pure and natural oils if you are worried about allergies. It is 100% DEET-free and can last up to 48 hours with cute designs to choose from! Just sticket it on your baby's clothing and you can now rest easy! You can even use it as adults specially when you are heading out for camping or going to an unknown area. Better stay safe than sorry! Like Strike Multi-Insect Killer on Facebook to get more updates and promos.